A painting of Leonard Cohen towering above Crescent Street in downtown Montreal. MONTREAL — Just inside the gate of the Shaar Hashomayim synagogue off Boulevard du Mont Royal, a gravestone bears an unusual Star of David, the sharp angles of its two opposing triangles — one reaching heavenward, the other aimed at the earth — softened into the shape of hearts. A dozen red roses scattered on the ground are signs of recent visitors, and an overflowing mound of stones on top, in keeping with the Jewish custom, is evidence of many more. The footstone is engraved in Hebrew with the name of the deceased, Eliezer the son of Nissan HaKohen. Beneath that, the name by which he is known to the world: Leonard Cohen. The legendary singer, songwriter, poet and novelist was interred here in a private ceremony in 2016, just hours before his family would inform the world that he had died days earlier, at the age of 82, at his home in Los Angeles. Though Cohen had been suffering from cancer and knew his death was looming, he died peacefully in his sleep after a nighttime fall. His grave is in the family plot beside three generations of his forebears. “He came into the world a Montreal Jew and he left the world a Montreal Jew,” said Gideon Zelermyer, the cantor at Shaar Hashomayim, who presided over the burial with the synagogue’s rabbi. It’s little surprise that a steady stream of visitors continues to make its way to Cohen’s gravesite more than a year after his death. Already well into his 70s, the singer achieved something rare in popular music — a late-career renaissance. It included five years of worldwide touring, hundreds of sold-out shows and several celebrated albums including “You Want It Darker,” which was released just weeks before he died, earning him his first solo Grammy Award. With his passing, interest in Cohen has surged even more, particularly in his hometown. Musee d’Art Contemporain de Montreal recently wrapped up a five-month multimedia exhibition that featured works by 40 artists commissioned by the museum in “loving tribute” to Cohen. A 10,000-square-foot portrait of the singer, barely-there smile shadowed by his trademark fedora and hand held over heart, towers over Crescent Street in the heart of downtown. Another nine-story mural of Cohen was completed last year. In November, a star-studded tribute concert at the city’s Belle Centre featured appearances by Sting, Elvis Costello, Seth Rogen and Prime Minister Justin Trudeau. The Montreal Jewish community that nurtured Cohen in his early years has not been overlooked in the Cohen surge. For a while, media interest in Shaar Hashomayim was so intense that the leadership had to issue a statement asking people to stay away. Inquiring at the city’s Jewish institutions today inspires knowing smiles from people who have grown accustomed to fielding questions about Cohen. “At least the third today,” said an official at the cemetery when a visitor asked for directions to Cohen’s grave. Cohen first encountered the biblical metaphors and liturgical themes that would inspire so much of his life’s work at Shaar Hashomayim, a fortress of a synagogue built by his ancestors that today occupies the better part of a city block. Cohen’s childhood home, at 599 Belmont Ave., is just up the hill, and a photograph of a teenage Cohen in double-breasted jacket at his Hebrew school graduation in 1949 still hangs on the wall. Music remains central to the service at Shaar Hashomayim, with a cantor leading prayers in the now nearly obsolete choral tradition once prevalent in Europe. It was that sound that Cohen sought out for “You Want It Darker,” which features Zelermyer and the synagogue choir providing backing vocals. But Cohen’s connections to the affluent Montreal Jewish community of his youth was never without complications. He fled the city’s confines early and often — first to study literature at Columbia, then to the Greek island Hydra, and eventually to Southern California, where he lived in a Zen monastery for years. Montreal was a place to which he returned occasionally “to renew my neurotic affiliations,” he once wrote. Liel Leibovitz, author of a 2014 book exploring Cohen’s artistic evolution, points to a 1964 speech that Cohen delivered to a symposium at the Montreal Jewish Library as the moment he found his prophetic voice. In the speech, which Leibovitz reconstructed from notes found in Cohen’s papers, the singer lambasted Montreal Jewry for worshipping a “hideous distortion” of G-d.
“Bronze plaques bearing names like Bronfman and Beutel were fastened to modern buildings, replacing humbler buildings established by men who loved books in which there were no plaques at all,” Cohen said. Today, the library has migrated from the cold water flat it once occupied to a modern campus in the western suburbs of the city, a symbol of the very Jewish fixation on buildings decried by the young poet. Yet Cohen never severed his connection to Montreal and its Jews, and the embrace only seemed to intensify as the years passed. “There are times when you want to show the flag, when you want to indicate that there is nourishment to be had from this culture, that it is not entirely irrelevant to the present situation, that it does not serve a nation’s best interests to reject and despise it,” Cohen told an interviewer in 2016. The synagogue reciprocated, proudly waving the flag of its most celebrated alumnus. Outside the sanctuary, across the lobby from where the faces of Cohen’s grandfather and great-grandfather, both past presidents of the synagogue, peer down from austere Victorian portraits, a glass case houses a vinyl copy of “You Want It Darker” and the Juno Award the album won from the Canadian Academy of Recording Arts and Sciences. Facing the case is a display showcasing Canadian Jewish history that prominently features a photo of Cohen onstage in a section about the community’s cultural contributions. 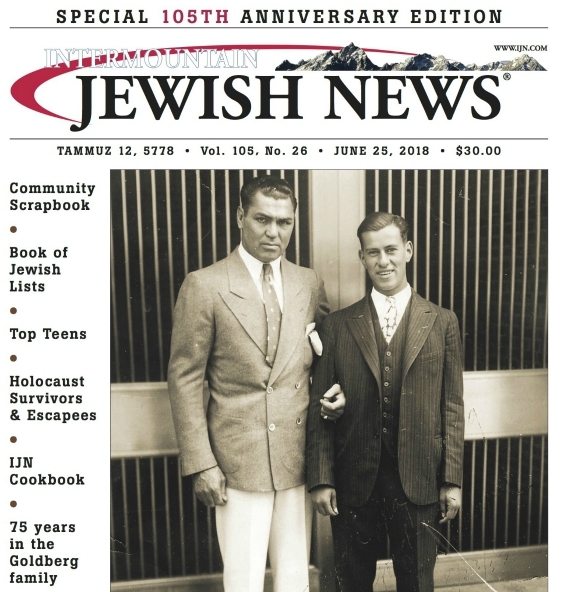 “It was such a validation of the fact that we hang on to these traditions,” Zelermyer said of Cohen’s enduring connection to the synagogue.